A combined team of Air Force Global Strike Command Airmen from the 90th Missile Wing at F.E. Warren Air Force Base (AFB), Wyoming, the 341st Missile Wing at Malmstrom Air Force Base, Montana, and the 625th Strategic Operations Squadron at Offutt Air Force Base, Nebraska, launched an unarmed LGM-30G Minuteman III intercontinental ballistic missile equipped with a single test re-entry vehicle April 26 at 12:03 a.m. Pacific Daylight Time from Vandenberg Air Force Base, California. The missile used in GT220 launched in the early hours of the morning with a launch command delivered from the Air Launch Control System on a Navy E-6 Mercury jet. The ICBM’s re-entry vehicle, which contained a telemetry package used for operational testing, traveled to the Kwajalein Atoll in the Marshall Islands, approximately 4,200 miles/6,759 km away from the launch site. Test launches verify the accuracy and reliability of the LGM-30G Minuteman III ICBM weapon system, providing valuable data to ensure a continued safe, secure and effective nuclear deterrent. «I can’t say enough great things about the partners I share this mission set with», Colonel Craig Ramsey, 576th Flight Test Squadron (FLTS) commander, said. «The men and women from the Task Force, the Airmen from my squadron, and our host unit here at Vandenberg made this look easy, but it was anything but that! It’s a testament to the dedication and professionalism of these proud organizations. I’m proud to play a small part in it»! F.E. Warren AFB is one of three missile bases with crew members standing alert 24 hours a day, year-round, overseeing the nation’s ICBM alert forces. The LGM-30G Minuteman III is one of three legs of the nuclear triad, which is also comprised of strategic bombers such as the B-52 Stratofortress and B-2 Spirit, as well as submarine launched ballistic missions, provided by U.S. Navy submarines. «I’m extremely proud of the 16 maintainers and operators from the combined 90th Missile Wing and 341st Missile Wing Task Force who worked hand-in-hand with the 576 FLTS to make this launch possible», said Lieutenant Colonel Tony Rhoades, Task Force commander. «This mission requires a tremendous amount of discipline, training and attention to detail. Our Airmen demonstrated this with true professionalism and proved that the Minuteman III remains the nation’s premier deterrence and assurance capability». 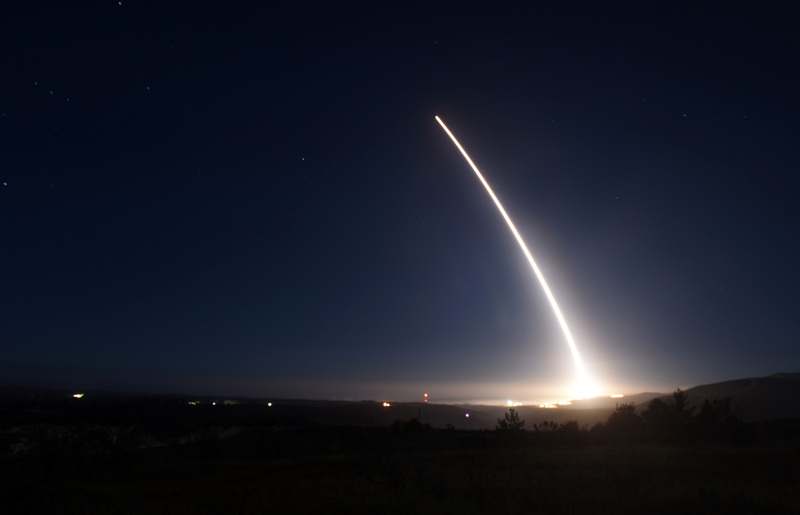 The ICBM community, including the Department of Defense, the Department of Energy, and U.S. Strategic Command uses data collected from test launches for continuing force development evaluation. The ICBM test launch program demonstrates the operational credibility of the LGM-30G Minuteman III and ensures the United States’ ability to maintain a strong, credible nuclear deterrent as a key element of U.S. national security and the security of U.S. allies and partners. A team of Air Force Global Strike Command Airmen from the 91st Missile Wing (MW) at Minot Air Force Base (AFB), North Dakota, and the 625th Strategic Operations Squadron (STOS) at Offutt AFB, Nebraska, aboard the Airborne Launch Control System, launched an unarmed Minuteman III InterContinental Ballistic Missile (ICBM) equipped with a test reentry vehicle at 11:34 p.m. Pacific Standard Time, February 20, from Vandenberg AFB, California. The ICBM’s reentry vehicle, which contained a telemetry package used for operational testing, traveled approximately 4,200 miles/6,759 km to the Kwajalein Atoll in the Marshall Islands. Test launches verify the accuracy and reliability of the ICBM weapon system, providing valuable data to ensure a continued safe, secure and effective nuclear deterrent. 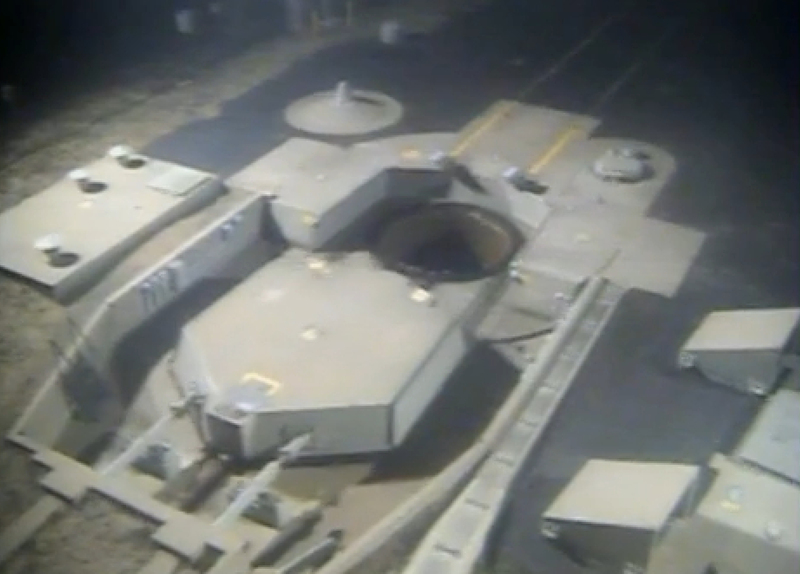 All MMIII test launches are supported by a team from the 576th Flight Test Squadron (FLTS) at Vandenberg AFB. «The flight test program demonstrates one part of the operational capability if the ICBM weapon system», said Colonel Craig Ramsey, 576th FLTS commander. «When coupled with the other facets of our test program, we get a complete picture of the weapon system’s reliability. But perhaps most importantly, this visible message of national security serves to assure our partners and dissuade potential aggressors». «It has been an amazing experience for the operations and maintenance members of Team Minot to partner with the professionals from the 576th FLTS, 30th SW and 625th STOS», said Major Keith Schneider, 91st MW Task Force Director of Operations. «Everyone involved has worked hard and dedicated themselves to the mission». A team of Air Force Global Strike Command Airmen from the 90th Missile Wing at F.E. 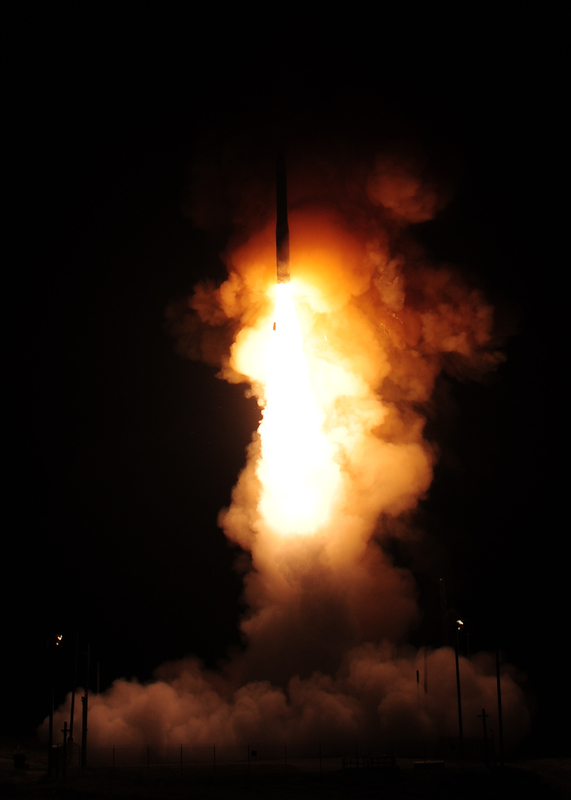 Warren Air Force Base (AFB), Wyoming, launched from here an unarmed LGM-30G Minuteman III Intercontinental Ballistic Missile (ICBM) equipped with a test reentry vehicle October 21. The ICBM’s reentry vehicle, which contained a telemetry package used for operational testing, traveled approximately 4,200 miles/6,759 km to the Kwajalein Atoll in the Marshall Islands. Test launches verify the accuracy and reliability of the ICBM weapon system, providing valuable data to ensure a continued safe, secure and effective nuclear deterrent. First Lieutenant Daniel Uresti Jr., a 320th Missile Squadron combat crew commander, said participating in a test launch is rewarding in that he can see the aspects of missile activities he does not typically get to see. «To see the components being built up and talk to the maintenance personnel has been extremely rewarding», Uresti said. «It helps bridge the gap between operator and maintenance terminology and helps us to understand just how difficult their jobs really are, especially when the weather is bad. These guys still get the mission done». AFGSC’s missile bases have crew members standing alert 24/7 year-round, overseeing the nation’s ICBM alert forces. Uresti said test launches give the ICBM force an opportunity to show the world that the U.S. has the capability and will to use these weapons should it be necessary. «We stand ready, every minute of every day, and we know our jobs well», Uresti said. «We literally hold the keys to the most powerful weapons ever developed and we ensure the safety and reliability of these weapons». Test launches are conducted with randomly selected ICBMs from one of three missile bases, located at F.E. Warren AFB; Malmstrom AFB, Montana; and Minot AFB, North Dakota. While at Vandenberg AFB, launch teams work under the direction of AFGSC’s 576th Flight Test Squadron and receive launch and range support from Air Force Space Command’s 30th Space Wing. Senior Airman Joshua Isom, a 90th Missile Maintenance Squadron electro-mechanical team chief, represented the 90th MW in the test launch. «It feels really great to be recognized and offered the chance to be a part of something not many people in this career field get to experience», Isom said. «As a missile maintainer, it is pretty awesome to help in the mission of providing the president of the United States with a capable nuclear deterrent». As an EMT team chief, Isom leads Airmen dispatched to missile fields located throughout Wyoming, Colorado and Nebraska. His team troubleshoots electrical and mechanical systems, such as the ground support equipment, security system, entry system to the site, as well as load the Missile Guidance System located on the missile. He said working as a team with other organizations at Vandenberg AFB has helped him to see the bigger picture and value of ICBM operations. «Everyone here at the 576th Flight Test Squadron has done an outstanding job in making sure we have everything to do our job safely, securely and effectively», Isom said. «I’ve learned so much on how the 576th test launches the Minuteman ICBM and how it’s tracked during the many stages of flight». 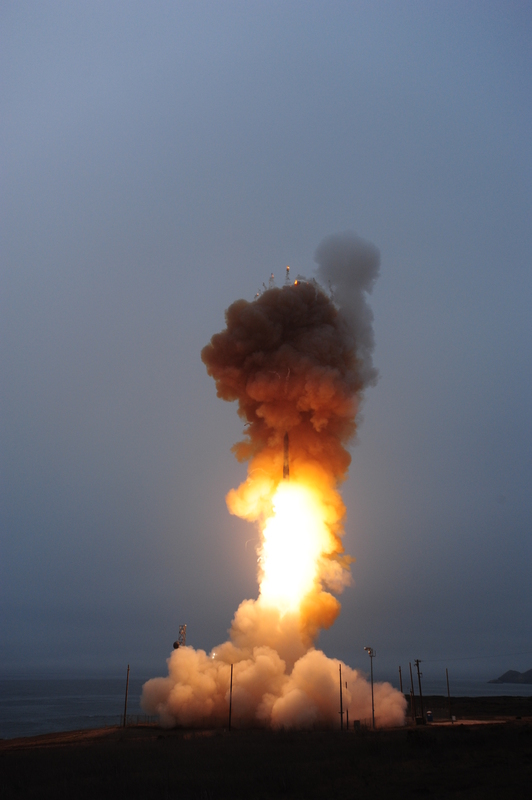 The ICBM community, including the Defense Department, the Department of Energy, and U.S. Strategic Command uses data collected from test launches for continuing force development evaluation. 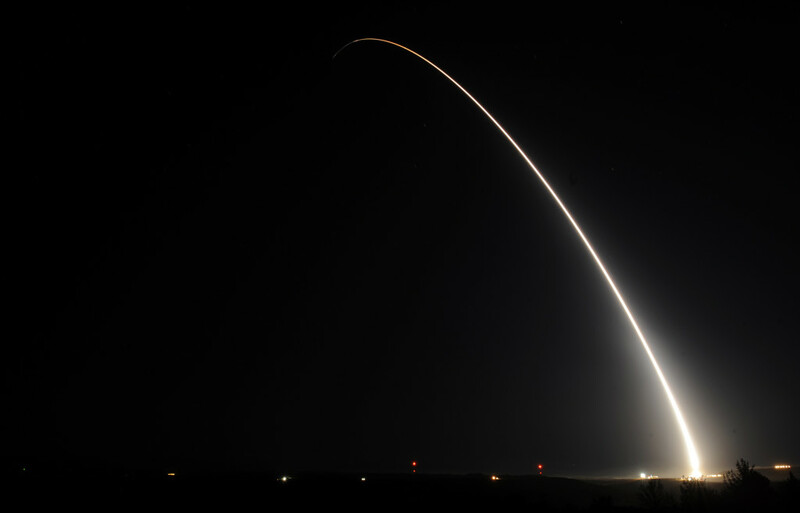 The ICBM test launch program demonstrates the operational credibility of the Minuteman III and ensures the United States’ ability to maintain a strong, credible nuclear deterrent as a key element of U.S. national security and the security of U.S. allies and partners. «As operators, we know our jobs inside and out. Our maintenance personnel are extremely knowledgeable and capable of building up a missile quickly and together we can ensure we get bombs on target», Uresti said. «The ICBM mission isn’t glamorous. The elements can be harsh and capsule life can be rigorous but we know the importance of what we do».